For Kentridge this edition is an ‘objet trouve’, comprised of separate drawings from two recent projects, which were pinned to the artists studio wall. The ink splash is from his recent opera Lulu and the slogan from Kentridge’s Notes Towards A Model Opera, a project on the Chinese Cultural Revolution. The ink splash recurs frequently in Kentridge’s work, both animated in his films and in his works on paper. For Kentridge gesture acts as narrative. Always monochrome, the mark is a character from traditional Chinese calligraphy, an expression of zen mindfulness, or the distraction of spilt coffee. Kentridge often uses repositories of information like dictionaries or encyclopedias as the background for his prints and drawings. Printed onto individual pages of ledger paper, dated from the 1920’s, each work is subtly different and features minutiae of calculations, marking the slow progression of advancing time. Kentridge’s epigrammatic slogans recall those used during Chairman Mao’s cultural revolution to stir the masses to thought and action. 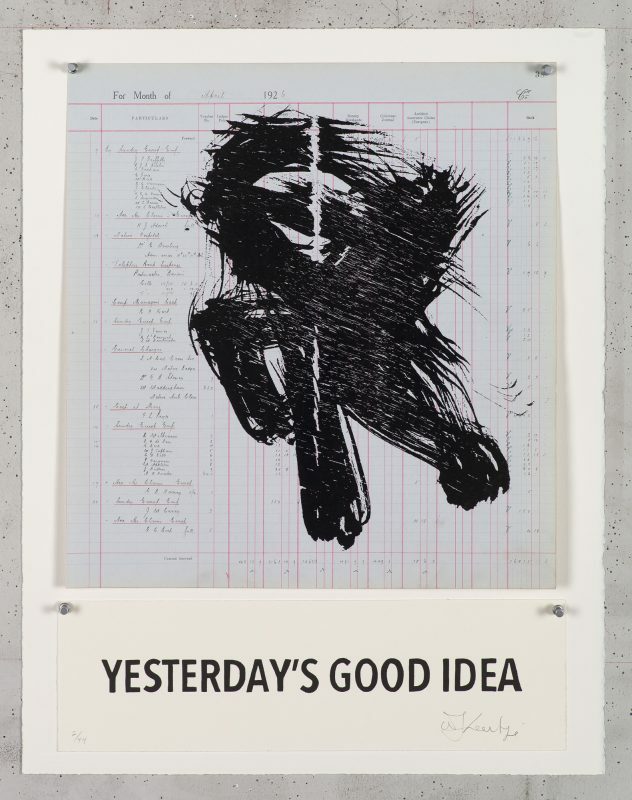 Typically serious and playful, Kentridge’s edition mingles the absurd with the coherent; the incongruity of the ink splash, reproduced as a carefully printed woodcut, the ledger notes quietly asserting exactness, with the lament for “Yesterday’s good idea”.